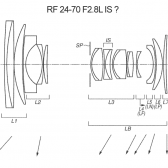 Northlight Images has done their usual weekly sorting of Canon patents to find some that may be of interest to the community and it looks like they have found one that may give some clues about future RF mount lenses. This relates well to the article from earlier today about what we expect to see released in the next year or so for the RF mount. In this patent, Canon shows an optical formula for an RF 24-300mm f/4-5.6L IS along with two variations of an RF 24-70mm f/2.8L IS. Both lenses would be obvious additions to the early years of the Canon EOS R system. Ouch - this makes my decision more complicated - do I go with the 28-70 f2, or the image-stabilized 24-70.. I'm still leaning towards the 28-70, just due to the enhanced optics and bokeh that I'll get from this lens. At the same time, I know the lens will be much heavier, and I wonder if the IS becomes a necessary ingredient here? For anyone who has the current 24-70 (without IS), how do you find it? Do you find that IS would make things better? If price isn't a factor, 28-70F2. I'll probably buy used. IS doesn't really matter to me since I shoot moving subject at wedding. For pose portrait, I have faster lens. You will be able to try them, hopefully. On paper it looks to be a total badass lens, they claim that it is as sharp wide open at f/2 as the EF 24-70 II at f/2.8, that's impressive. But not only is it the most expensive for a native mirrorless setup (ok, apart from the Sony 400mm), it is also probably the most front-heavy-feeling ever made amongst them. What I mean is, when the lens is not that big but thick and weighs as much as this, it will feel even heavier (like Leica Noctilux lenses, which feel very dense) so it may become a bit shaky after a while using handheld, and there is no IS. That might actually matter a bit more in practice, than how sharp the lens can be. The RF 24-70/2.8 IS may also be close to or just over 1kg, but that is quite a bit more manageable, it should be better than the EF 24-70 II as well, and the IS may also come in handy (for both photo and video), until they put it in the later bodies as well. yI have the 24-70/4 IS, and the older 24-70/2.8. Personally, I like the 4 better, but mostly because it's smaller and lighter. I often have the 24-70 as a second camera clipped onto my bag or chest, and the difference in weight and size is quite significant, especially for a walkaround second camera. I've never had a problem with blurry pics on f/2.8, though. The question of how helpful image stabilization is simply comes down to exposure settings (shutter speeds) you prefer to shoot at, and also whether/when you use prefer a flash. True, but weight distribution is also important. The 24-70/2.8 Mk1 with a DSLR is still fairly well-balanced. But why did they do two lenses so close together? Why not do a 24-70mm f/2.0 L lens? I love my current 24-70L....(version 2)....and would be excited to get it in f/2.0...not sure I'd want to lose that extra wide end for a 28-70. Anyway, is there a good reason not to just do the 24-70 in f/2.0? I wonder if they intend to make an EF 24-70 2.8L IS too even as a commitment to EF line or not. You mean, other than the 28-70/2 already being supermassive and superexpensive? It's a very different tool than a 24-70/2.8 IS, the similar focal length range notwithstanding. I like the 24-70 f/2.8 II as it is. IS is more "necessary" at longer focal lengths, and you need to give IS time to stabilize before taking a shot. This occassionally ruins photos for me when I'm acquiring a different subject with the 70-200 or 100-400 (sports). For shorter focal lengths, IS is not as necessary for people shots because subject movement sets the shutter speed anyway. For still life or landscapes, IS can be beneficial at the shorter focal lengths. However, having both the 16-35 III and the f/4 IS, I usually favor the larger aperture over IS, and for the 24-70mm focal length range, I don't think IS would be a big factor -- overall IQ would. I'd have to try it out, but the 28-70 f/2 is intriguing. It's heavy, but then you might not have to bring any primes. I have the 24-70 f/2.8L II - IS would have been nice, but I think if you know you're not going to have it you work around it. I've often just really pumped my ISO and kept my shutter speed to 1/(2x focal length). Typically, if I'm hand holding a photo in low light then it is probably of people, and even with IS I don't trust most people to stay still so IS won't fix all my problems. Also, IS would have made the lens heavier, so that can be a serious negative depending on the user. I am betting the RF version has IS because the thought is that will be a key video lens on the EOS R and whatever comes after it. Also, considering that the 24-105 f/4L got a bit smaller, Canon may be able to add IS to the 24-70 f/2.8 on RF without it being much heavier than the EF version. Canon is trying very hard to take all my money. I've been waiting for an update to the 28-300mm F/3.5-5.6L IS USM for a long time. It looks like it may be here soon. I still prefer the EF series (and to tell the truth I am heavily invested in EF lenses) but if they do not produce an EF version of this lens I will start worrying. True, I will still keep preferring my EF lenses/system and I will not switch but I will put an end to getting new EF lenses (keep in mind that I do not say stop updating my EOS bodies because I would be a liar!). Also being a hobbyist and not rich I do not know if I will ever be able to switch completely. I truly hope they will keep all product lines active. From everything I have read, an F2 24-70mm would be just too big. Hard to believe that just one stop makes that much difference in glass elements requirements but it does. I wonder how *much* more? I mean, could it possibly be any larger and unwieldy than the Canon 11-24L lens? Whew...that's a beast, but I love it!! I agree, I've been waiting for that update as well. If they only roll it out on RF, though, I'll be quite annoyed. As much as it makes sense in the RF line, it also makes sense in the EF line. I like it. I’d like for it to have IS, of course, but for the time being I work around it (e.g., not using it on the high-res 5DSR). IQ is decent, if not extraordinary (particularly at 70mm 2.8, its weak spot). All three have a very small focusing group, just a single small element for the two 24-70 implementations. Looks like they could be Nano USM like in the RF 24-105 and that could mean very fast (and smooth) autofocus.